Put the world on your wrist with Motorola's 2nd Gen Moto 360 Smartwatch. This men's 42mm watch comes in black with a black chamfered bezel and a black Horween leather band and runs on the Android Wear operating system. It connects to your Android or iOS smartphone via Bluetooth to give you the information you need when you need it and displays it before you ask. The Moto 360's 1.37" LCD touchscreen has a native resolution of 360 x 325 and shows "cards" of important info, including text messages, emails, missed calls, weather, navigation, and more, as well as app notifications that can be configured via the free Android Wear smartphone app. It alerts you with a gentle buzz on your wrist, so you can quickly glance at your Moto 360 to see new information. The Moto 360 is always waiting to hear from you, it and can be voice-controlled without pressing a button. Simply say, "OK, Google" or tap on the screen and speak to operate your watch. You can get answers to questions, like "What's my next appointment? ", "How do I navigate home? ", "Where are nearby coffee places? ", or "How tall is the Eiffel Tower?". You can also ask your Moto 360 to complete actions such as sending text messages, taking notes, scheduling meetings, and opening apps. Just tell your Moto 360 where you want to go, then let the step-by-step navigation instructions in the watch display guide you to your destination. Navigation instructions that you set up on your phone will also appear in your watch display. Moto Body is a built-in activity tracker, designed to inspire a healthier lifestyle. It features a pedometer to keep track of your movement and an optical heart rate monitor, which monitors your heart rate and lets you see how much time you've spent in various heart rate zones. When not showing a card, the Moto 360 takes advantage of its round screen and displays the time, just like a traditional watch. You can tailor the watch function to your style and mood by selecting from one of a variety of pre-loaded watch faces or even customizing your own to add a personal touch. Bluetooth 4.0 Low Energy (Smart) allows your phone and Moto 360 to stay connected throughout the day, while minimizing impact on battery life. 802.11 b/g Wi-Fi lets you get updates and notifications over your wireless network, even if your phone isn't connected. The Moto 360's all-day battery charges when the watch is placed onto the included wireless charging dock. While charging, it displays the time and charge level, making it ideal for bedside tables and desks. The Moto 360 has an IP67 rating, which means that it can be immersed in up to 3.3' (1m) of fresh water for up to 30 minutes. The Moto 360 is compatible with Android devices running Android 4.3 and up as well as iOS devices running iOS 8.2 and up. 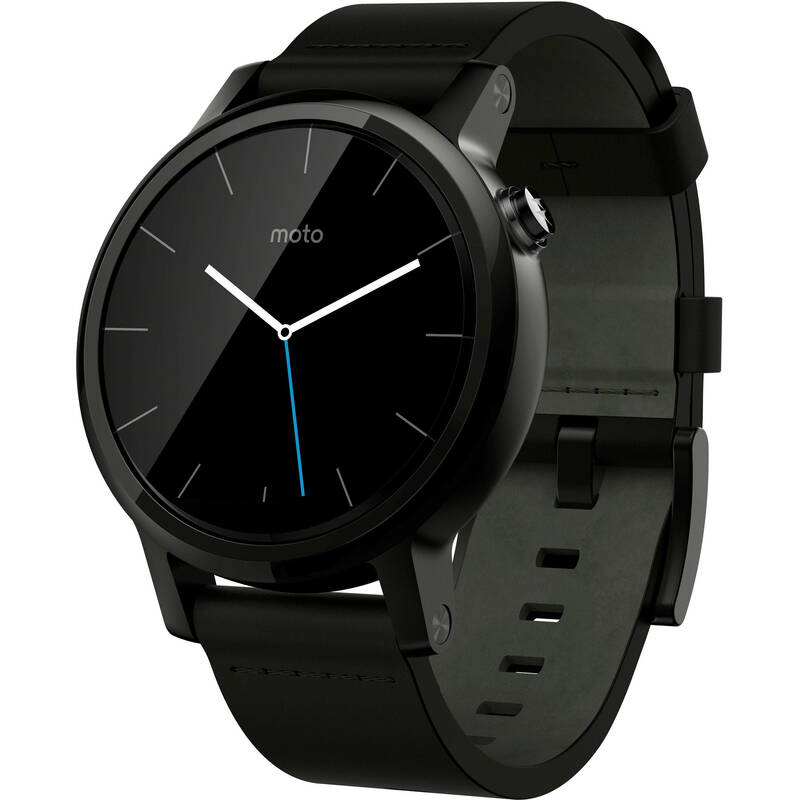 Box Dimensions (LxWxH) 5.8 x 5.3 x 3.8"
2nd Gen Moto 360 42mm Men's Smartwatch (Black, Black Leather Band) is rated 4.6 out of 5 by 20. Rated 5 out of 5 by Trombot from Great improvement over Gen 1 Moto 360 I bought the gen 1 moto 360 the first day it went on sale and loved the utility of it, but was terribly frustrated with battery life. Aesthetically, it left some to be desired given that it looked like a round computer attached to a strap. This 2nd gen fixes nearly all the wrongs of the 1st gen, especially if the 'flat tire' look doesn't bother you. The battery life is much better and easily gets me through a full day and more even with a 3rd party screen app and always on mode. The frame of the watch is more appealing and the option for the smaller face was a winner for me. Great purchase! Rated 3 out of 5 by ayman from Nice screen , clumsy body, falls in the middle body: the smaller size 42mm is disappointed, the leather band is slippery, uncomfortable, the watch is really thick for this diameter , the 2 o'clock button is a good touch, the black clor comes sharp and cool. Screen: good brightness even in sun , good battery, nice watch faces. Productivity: connect and disconnect app- Bluetooth with I Phones all the times, very frustrating, very helpful functions with mic activated orders, might work better with android , it falls some where between being not really sporty like the Fitbit and notreally functioning like the apple watch , so you decide.for me theconnectivity issue was a deal breaker. Rated 5 out of 5 by Anonymous from Great watch Great watch. I love the features, compact size, and the longer battery life than the older version. Rated 3 out of 5 by Anonymous from Still learning the product. Not overly impressed The MOTO 360 has a lot of quirks and oddities. It has locked up a few times in a couple of weeks. Its use is not intuitive. It does, however, accomplish the work that I purchased it for. Rated 4 out of 5 by Anonymous from Great Product at a Great price. I bought this for my husband and he loves it. He has a moto droid cell phone. So far the only thing he does not like about it is: the bottom part of the screen has a sensor in it that takes away from screen. At first we thought it was broke but it is how the watch is made. You get used to it though. All in all great watch and product. B&H had best price for it too! Rated 5 out of 5 by T-Bar from Would I or Would I Not? What a GREAT product. I'm still learning how to get the most out of it. I purchased it for a specific purpose but don't have the APP I need to fully evaluate this watch. If all goes as planned I will be purchasing more watches like this one in the near future. Rated 5 out of 5 by Anonymous from Great smartwatch Nice product, with great design and size. It updated automatically to Android 2.0 and integrated seamlessly with several apps (Gmail, WhatsApp, Google Fit, etc.) Battery lasts for about 2 days, using apps normally. can I download my custom application? As long as said application is available on the Android Wear App Store it would be compatible. This is a new unopened item.